Yeah, that’s about all I have to say. It seems like all I do is cover SXSW. Well, I promise you that I will point y’all to my other interests on the other two blogs I have here real soon. Yes, that’s right I’m running too other blogs. At some point I will bring it all together. Until then I will showcase them here as well talk about what I’m bringing to SXSW this year and to the blog afterward. 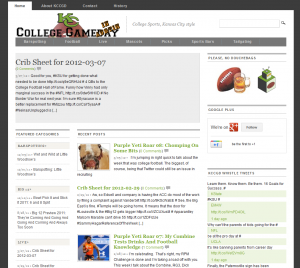 First up is my longest running blog, KC College GameDay. I started this with a friend in Kansas City as a reason to go out to bars on Fall Saturdays to watch college football. I still do, but will not do it as much next fall. Streaming is taking over the world, including live sports (sorry Disney/ABC/ESPN). But I will give my unique voice on college sports in the form of video and social media. I may jump on and do some articles here and there, but for now it’s a new media day down there. Next up is something I’ve neglected for awhile but am coming around on pretty strongly now. That would be Helping Zero Knives Enter You (or h0key). Not only is it a clever acronym, but it’s also my music hub. So I’ve been reviewing concerts and SXSW on the blog for a couple of years now but I’ve turned myself toward making music. I took the RPM Challenge and will focus more on my music and the gadgets the run it. Don’t worry, I live in the Live Music Capital of World (Austin) so I will continue the concert coverage, especially for SXSW. Which brings me to this year’s SXSW. The last two years, I was tourist. Now I’m a homer. It’s a new experience still and I’m stoked about it big time. Heck, I’ve already done the Startup Crawl am glowing from such a good time already. So this year will be different but it will also be the same. Is that a good thing? I hope so. I will put to that to the test. It may have worn off on me. I guess it boils down to my focus. Two years ago it was for the experience. Last year it was to actually connect with like minded people. This year, I want to hone my craft with like minded people. With my music creation bubbling up, I feel like I need to sit through some music session and not just get wasted at the day music parties. Also, I want to focus more on music technology. Whether it’s building a cool concert going app, or building my very own USB Midi controller. I’ll judge my success this year on how deep I make down those paths. So how deep will I go here? Well, it has been SXSW central as of late around here. 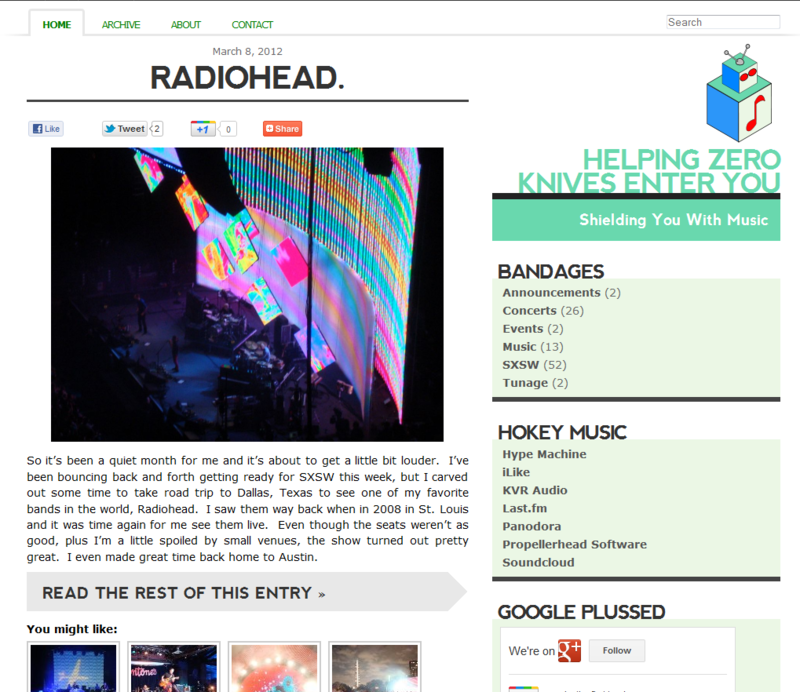 My showcased blogs are nice, but I think I need to flaunt my technical skills just a little bit more here. With my lean toward music technology, I will more than likely bounce back and forth between this and h0key. That’s not to say that KC College GameDay will be ignored. It just means that actual, thought provoking writing will come from here, music from h0key.net, and my video craziness from KC College GameDay. Hopefully, it will come together well. If it doesn’t, I’ll figure something out. I’m not going to let this down just yet. Not with SXSW kicking off Friday. 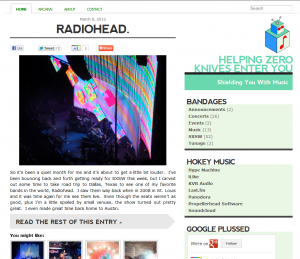 So expect to see the usual updates here and more of the same over on h0key. The food gods owe me one this year because of food sickness last year so I’m hoping to break the total number of bands seen. Although, the music session might hurt that. Tune in here and everywhere to find out. Previous PostSXSW And My Magic Carpet Ride: Vote for My Panel For SXSW Interactive 2012Next PostSXSW 2012 Day 01: Let The Gauntlet Begin!